Belay devices allow you to provide a controlled lower and stop a fall with minimal effort because of friction and tight angles whether its a passive or active device. 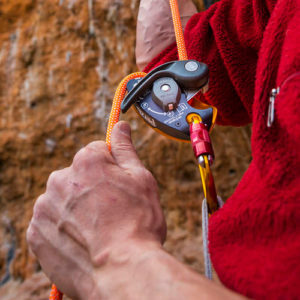 With all the different styles of belay devices on the market, knowing the unique uses and characteristics and limitations of each will help you select the right device for your specific adventure. One of the most common belay device styles and is a passive belay device with no moving parts. Tube devices grew out of the original Sticht Plate. They create friction by running the rope through a small slot around a carabiner and back out the slot. 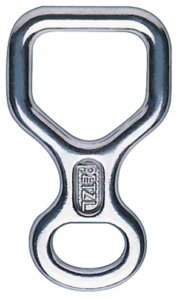 The tube shape of the device provides allows for sharp bends in the rope’s path (increased friction and control), helps dissipate heat, and allows for the use of channels as in the PETZL VERSO. Tube devices are recommended for beginners learning proper technique. While tube devices evolved from plates to allow a lead belayer more stopping power and control of the rope, plaquettes evolved from plates as a means for a belayer at the top of a climb to secure the following climber. Essentially a Plaquette is a tubular belay device with an additional metal loop on the side. That metal loop allows you to attach the device directly to an anchor and set it up in assisted-braking mode. Plaquettes function by hanging freely from an anchor with the climber strand of the rope running into device above the brake strand. When set-up correctly, a fall pulls the climber strand of the rope down onto the brake strand locking the device Plaquette’s are not “hands-free” devices and the belayer must maintain control of the brake strand at all times. 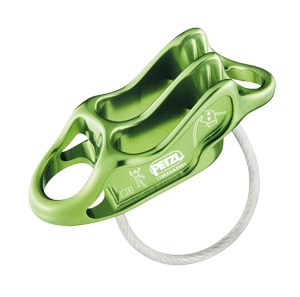 Another Petzl invention is the concept of “Assisted Braking.” Assisted Braking devices make it much easier for a belayer to arrest a fall, or support a suspended climber. 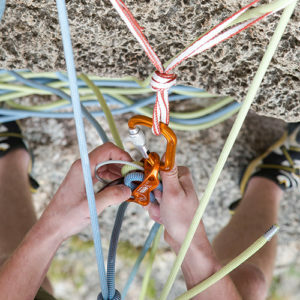 In a Tube device, the climber is stopped by the belayer physically halting the movement of the rope through the device. 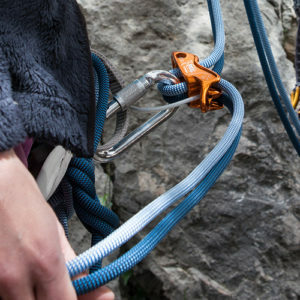 In an Assisted Braking device, the belayer must maintain control of the brake strand, creating enough friction for the assisted braking to engage. Once the device is locked it is much easier for a belayer to hold or lower climber. The mechanism of assisted braking is similar to the plaquette devices, as force is applied to the climber strand, that force is used to impede the movement of the braking strand. With the GRIGRI family, this is achieved through a pivoting cam which is pulled into the brake strand. Still popular as a dedicated descent device, figure eights were the first multi-purpose climbing tool for belaying and rappelling. By threading the rope through the device in various configurations the amount of friction on the rope could be increased or decreased. For more information on belaying with a Figure Eight view the HUIT technical notice. The Petzl VERSO is an ultra-light and affordable tube-style belay device. Featuring V-shaped slots on the brake side of the device and ARC technology, the VERSO provides increased control on a wide variety of rope diameters. The two slots on the device allow you to belay and rappel using one or two lines. The REVERSO features a similar design to the VERSO, utilizing ARC technology and V-shaped slots for better rope control. However, the REVERSO features a third and fourth hole that allows you to use the device directly off the anchors in plaquette mode. For more information view the technical notice on the REVERSO web page. The GRIGRI was the first belay device to feature assisted braking technology. 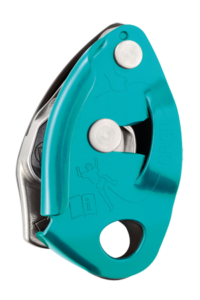 Usable with only one rope, the assisted braking function of the GRIGRI uses a camming device to help capture the rope for better control while lowering a climber or catching a fall. 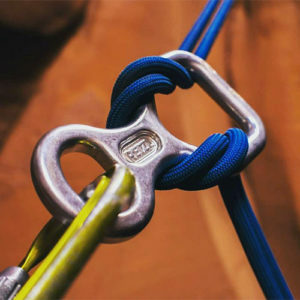 For more information on belaying with a GRIGRI, click here. 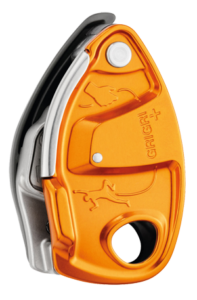 The GRIGRI + operates with the same core principles as the GRIGRI 2, but features four key differences: a steel wear plate, belay mode selector, anti-panic function, and increased rope range. 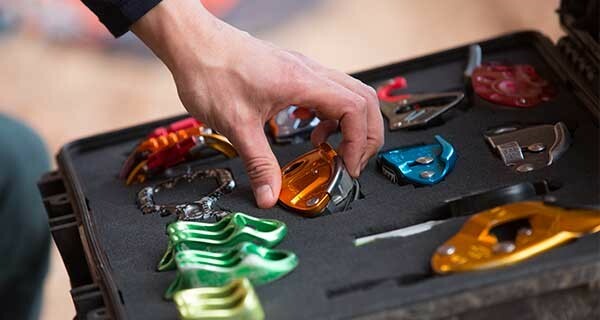 If you are not sure whether the GRIGRI + or the GRIGRI 2 is right for you, read the Should I Upgrade To The GRIGRI +? article. The traditional figure eight device. 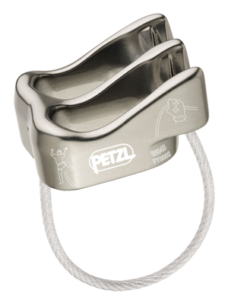 The Petzl HUIT is now primarily a descent device for canyoneers and may be used with single or double ropes. The HUIT ANTIBRULURE features an “anti-burn” tab to allow a user to handle the device after a long or rapid descent. Note: Belay devices may be used as descent devices, but not all descent devices may be used as a belay device. For more information on descent specific devices examine the PIRANA, STOP, SIMPLE, or RACK here.